Louis Napoleon, a.k.a. Napoleon III, gets a bad rap from history: he is often seen as a sort of tragicomic coda to the glories of his uncle, the “real” Napoleon. Even people who scramble for apartments in elegant mansions on the avenues planned by his man Baron Haussmann tend to think of him (if at all) as the despot who knocked down swathes of Paris to give his troops clear fields of fire on the city’s dreaded revolutionary mobs. The ruler who presided over nearly a quarter-century of middle-class prosperity from 1848 to 1870, first as president and then as emperor, Napoleon III gets short shrift from anti-bourgeois anti-colonialists. The surrender of Sedan and the loss of Alsace-Lorraine overshadow the victories of the Crimean War and the annexation of Nice and Savoy. 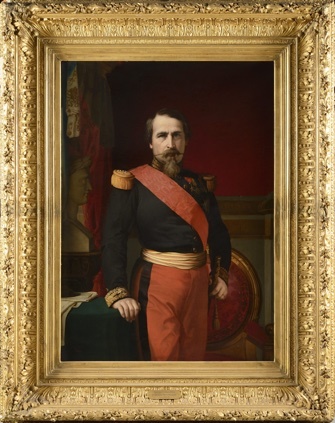 Even his name confuses: Why Napoleon III, when he headed the Second Empire? Louis Napoleon dubbed himself Napoleon III to cloak his coup d’état in his uncle’s imperial legacy and to acknowledge the reign of Napoleon II, nicknamed “L’Aiglon,” although that reign lasted two days, April 4-6, 1814, in between Napoleon I’s two abdications, when the said “eaglet” was three years old. A lot of dynastic mythmaking was going on in those two words. Christopher “Kip” Forbes, vice chairman of the Forbes publishing group and an avid collector, has spent much of the past 50 years on a private quest to rebalance the historical narrative, building a vast collection of Second Empire art and memorabilia in the process. 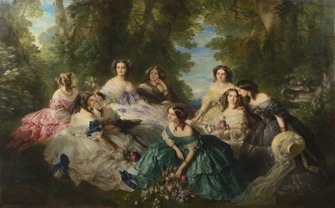 This hoard is now being sold off over three days at the Osenat auction house in Fontainebleau, on March 5 and 6, and April 9. “Emperor Napoleon III in His Study,” by Eugènie Montpellier and Hyppolyte Flandrin. © Osenatportraits to satirical cartoons, letters, photos, rare books, sculptures, imperial Sèvres porcelain and royal baby clothes, the collection is light on museum-quality art but rich in decorative, historically evocative and affordable bits and pieces. Wickedly funny are more than a dozen sets of French and English caricatures and cartoons, a satirical poke at the pretentions of the imperial family and imperial politics, mostly estimated in the low to middle hundreds of euros. They include two sets of four satirical drawings of the emperor by Ferdinand Bac, particularly interesting because the artist was an illegitimate cousin of his subject. Also interesting are a couple of dozen sketches and drawings by members of the imperial family, mostly estimated between €500 and €1,500. They include lively pen and pencil sketches by the emperor’s son, Napoleon Eugene Louis, and portraits by Princess Mathilde Bonaparte, a cousin and famed literary hostess whom he nearly married. Military art buffs can have a field day with a pencil study by Degas of the heads of Napoleon III and his army marshals (estimated at €25,000-€30,000) and multiple battle scenes and uniform illustrations by the leading military painters Édouard Detaille and Alphonse de Neuville. Even if nothing takes your fancy, it’s a good excuse for a day out in Fontainebleau. Reader reaction: Click here to respond to this article (your response may be published on this page and is subject to editing). Please support Paris Update by ordering books from Paris Update’s Amazon store at no extra cost. Click on your preferred Amazon location: U.K., France, U.S.
More reviews of Paris art shows.